Last year was my first yea r in triathlon, and doing a half iron was never the plan. But I did it, and when I crossed the finish line of Timberman 70.3 2009, I was determined to train hard and break 6 hours in 2010. So for a year that has been my main goal. However, life always has a way of stepping in! For the last few months I have been struggling with serious depression. Things have gotten very bleak at times, and as a consequence, I've missed entire weeks of training as I sometimes was unable to even get out of bed in the morning. I came back from cheering on teammates at IMLP injured and out of sorts. The last month has been very hard, and leading up to the race, I'd barely spoken to anyone or left my house, had only done short workouts, and not enough of them, and had been trying to decide if I should even go through with the race. I did not feel prepared at all. After much debate, I finally decided to at least start the race, but that it would be one of my last races. After Timberman, I am signed up for Cranberry sprint relay, Pumpkinman relay, Lobsterman olympic, and Mohawk-Hudson marathon. That's more races than I've done the entire rest of the tri season! My plan is to finish out these races (if I can get healthy) and then pack it in. After 3 years or so of trying to be an athlete after a lifetime of being an overweight couch potato, I still feel like a fraud most of the time. Like that Sesame Street song, "which one of these is not like the others? Which one of these just doesn't belong?" Anyway, back to Timberman. After a fun time Friday night camping, and watching the sprint race on Saturday, we relaxed by the fire on Saturday night, and then went to sleep early. Only to be woken up at ~2AM by the sound of POURING rain. I was very nervous, since it was my first time using my tent, so I wasn't sure how waterproof it was. I slept fitfully after that, finally getting up at 4:30. Brett, Nicole, Nikki and I took the shuttle from Gunstock to Ellacoya, and proceeded to transition. I tried to distract myself by taking pictures of teammates and friends, which slightly backfired when I lost my camera! 2 days after buying a camera, and I lose it! After freaking out, luckily a volunteer had found it. Phew, but my nerves were pretty shot after that. I warmed up in the water with Kim for a bit, and then we ran to the start since our wave was next. Huddling with Nikki, Kim, Lauren, and Nicole, I just tried to breathe normally and was trying to decide if I was swimming or running out at the beginning, since it was shallow for quite awhile. I decided it would keep my heart rate down and use less energy (plus, I'm short, so my arms wouldn't hit the ground the way others were) to swim right from the get go. As soon as everyone finally started to swim, I got kicked - hard - in the face. Luckily, it just pushed my goggles further into my face instead of off. Since I have contacts, this has always been my biggest fear in triathlon. Since it happened right at the start of the race, it actually relaxed me, and I ended up having one of my best swims ever. The water was very rough, I was a little worried about getting seasick, and felt like I was body surfing at times. After the last turn, I started to get a little tired, and my shoulder was burning. In December, I had shoulder surgery, and could not get in a pool until March, and have had some setbacks with building up my strength. So my mind started to wander a bit as I tired, and I suddenly realized that I was slowing down, and I had been forgetting to sight! I snapped back to the race, pushed hard, swam over a few guys that were also heading in the wrong direction, and got back on the path to the swim finish. Not only was it (barely) my fastest swim, but I was able to bilaterally breathe almost the whole time, and did not stop when someone hit me or swam over me, both of which are major improvements in conserving my energy. As I got out of the water and pulled off my swim cap, I dropped my Garmin. So I had to jump off the ledge to get it back, and I felt my quad pull as I climbed back up. I grabbed a water, got 'stripped' and headed to transition. Heard my name called, and there was Shaun with my chamois butter. Thank you so much! In transition, I looked around, and saw Kim, Nicole, Brett, and Jay around me. It was comforting to see teammates; I just wish I had less time to see them, as I couldn't get my helmet on, and had a 4.5 minute T1! Finally got it on, and was off! Mounted the bike right in front of the tent, so got to hear everyone cheering as I headed out for a 3 hour ride. The bike was fairly uneventful, except for getting screamed at by some guy from NY that I tried to pass, because he was riding his brakes down a fairly shallow hill, and losing my water bottle because my race belt was interfering with my ability to get into my pockets (luckily I didn't take anyone out!). I can't have a water bottle cage on my bike frame because it's a Y Foil, so I carry one in my back. pocket. I’ve avoided using the saddle-mounted cages because I’ve had bottles eject in front of me. Ironic, I know. I also was disappointed that I was always in big packs of people riding their brakes in the middle of the road on ALL of the major downhills. I was forced to go a lot slower than I wanted to. But I really enjoyed the bike, even though I wished there were a few more chances to come out of aero, as my shoulder was killing me! The injuries that I've been struggling with are my L glute and my R hamstring. Last week, I was barely walking. The glute was actually feeling better after a deep tissue massage by Lauren S on Monday. But the hamstring, while better, was still really sore. It started to bother me towards the end of the bike, and since the way back was a little more uphill, and I knew I still had to run (which I was very nervous about), I decided to dial it back a little to save some legs. Pulling into T2, I was worried I had very little in reserve. I thought my T2 was fairly quick, but it was actually 3:33. I'm not sure what I did for 3 minutes. I debated about using the portapotty, decided not to, and headed out on the run. I wanted to run ~10 min/miles, which should have gotten me in at right about 6 hours. I was supposed to start out slow and then pick it up if I felt better. I managed to stay pretty steady, and averaged ~9:50 on the first loop. I held that for 2 more miles, and then it all fell apart. My R knee no longer felt like it was attached to the rest of my leg! And my hamstring was just excruciating. I started to walk more and more. It got to the point where I was only able to run the downhills, where gravity was helping out. I had "One Foot in Front of the Other" (http://www.youtube.com/watch?v=f9jeh4mA5us) in my head (yes, clearly, I watched too much TV as a kid, lol). I saw lots of teammates out on the run (and was very jealous of those that were finishing!). It helped a lot to look for the blue & green, and try to offer encouragement in turn. Only one mishap when I called Joe, Cory (yeah, I know, they look so much alike, right?!). I also got to take my mind off my painful legs for a mile or so as I tried to figure out who the mystery BTT photographer was (that I now know was Pat). And I got a laugh when Sue told me I was 'almost finished' after the first loop! I really do love being a part of this team. I also saw quite a few friends from Dreamfar, BPC, Zoom, SRR, which was great, since I was focused on everyone else, and not the bad voice in my head that was telling me I wasn't cut out for this. FINALLY, I turned down into the finisher chute. 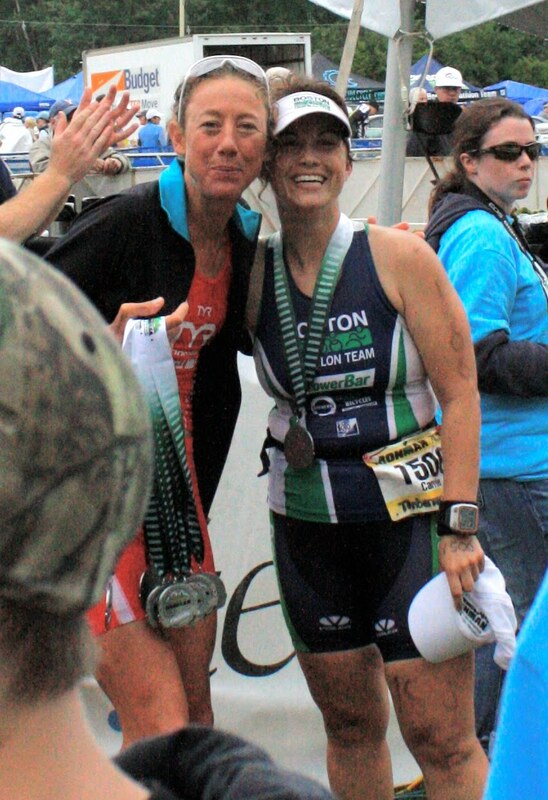 I was excited to see that Chrissie Wellington was at the finish line again handing out medals. My friend Lisa was also there, waiting for her boyfriend to finish, and she took a picture of me with Chrissie. That was awesome! All in all, I guess I'm happy. Can't quite get past the disappointment of being that close to hitting my goal, and not being able to hang on. But I followed my nutrition plan this time, and didn't have the stomach/dehydration problems that I had at Mooseman. I had a PR on the swim and the bike, and could have broken 3 hours on the bike if I hadn't dialed it back so much the last 15 miles. I felt strong overall, I just didn't have that last little bit I needed.